When teaching a horse to stop the trainer needs to understand the definition of “whoa”. And that definition is “stop and DO NOT MOVE”. This means no movement of the feet until the horse is given the next command or cue. Every person who handles a horse is a trainer. Becoming distracted and allowing the horse to move teaches the horse it is permissible to cheat when executing the stop. This does the horse no favor – it only leads to confusion and lack of discipline. It sets you and the horse up for failure when stopping and standing still is necessary. So put down the cell phone and pay attention to your horse. Horses learn what “whoa” means during leading lessons. Foals will only be able to stand still for a few seconds after stopping due to short attention spans. Keep daily lessons brief – working with the youngster for a few minutes every day will lay a good foundation. At this stage repetition and gentle reinforcement is the key. As the youngster matures, the length of time for standing still will increase. Unfortunately confrontation is a requirement for learning. There will be a time when you will need to confront the horse about not responding to the cue to stop, or not standing still after the stop. Dr. Jennifer Williams, instructor for the HorseCoursesOnline.com course “Understanding Equine Behavior”, explains, “Reinforcement increases the likelihood of a response. But when reinforcers are no longer given, eventually your horse stops performing the behavior you’ve conditioned/trained. This is called extinction or extinguishing a behavior.” During training sessions properly executed stops and standing quiet should be reinforced by rewarding the horse with a verbal “good boy”, a few minutes of rest, or a pat on the neck. The trainer must be prepared to use positive punishment when the trained horse cheats with a lazy stop or doesn’t remain standing still until the next cue is given. 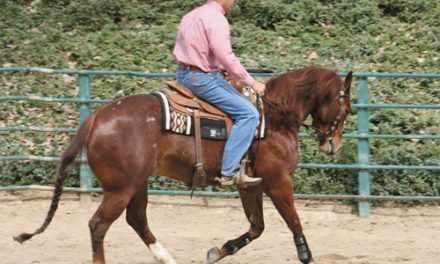 When handling the horse in-hand this can be a sharp jerk on the lead and backing a few steps. The use of a stud chain over the nose or under the jaw may have to be utilized for horses that don’t believe you mean business. Under saddle this could be backing a few steps after a “lazy” stop. Dr. Williams reminds her online students that no matter what reinforcer is used it must be implemented right after the behavior. 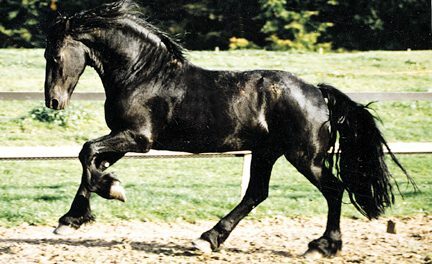 Eventually most young horses will advance to lungeing as part of the training program. Reinforcing the stop when a horse is 25 feet away from you can be daunting. All horses must know that “whoa” means STOP and DO NOT MOVE before being lunged. When asking the lungeing horse to stop, say “ho” and move your body to a position in front of the horse’s natural balance point. This will block the horse’s forward movement and effectively bring him to a halt. If the horse doesn’t respond correctly, give the verbal command again, followed by a jerk on the line. (Be sure you are lungeing the horse with a chain over his nose so the gentle jerk on the line has some meaning. If you cannot get the horse’s attention, the physical cue is useless.) Repeat the verbal and physical commands as often as it takes until he understands the message and complies. 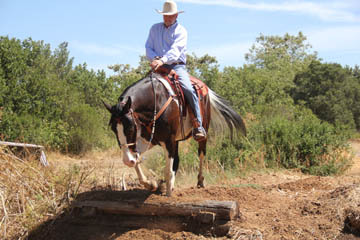 Be sure you have moved to a position in front of the horse’s balance point when asking for the stop. It may take three or four tries to get the horse to stop, but he’ll soon get it. Praise him when he does. Do not allow him to turn and face you; do not allow him to come into you. Walk to him and pet him on the head and neck, then go back to your original position and restart the horse at the walk. Repeat the stop command, and when he stops, praise him. Teach the stop at all three gaits, and go both directions. Stopping the horse while under saddle will now be easier to teach – the horse recognizes the verbal command to stop and understands it meaning. 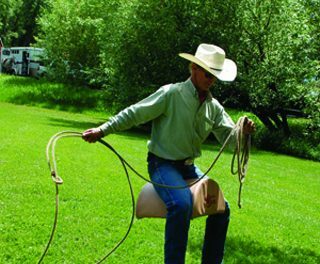 Teaching the horse to ground-tie is a great aid for reinforcing the “whoa”. When grooming or tacking-up remove the horse from the crossties and make him stand still as you move around him. If he moves, put him back in place and tell him “whoa”. In several days he will understand that he is not to move. Allowing plenty of time to learn is the key to teaching stopping, as with other specific performances. Don’t rush the horse. Proper training, along with reinforcing the behavior, will result in the desired performance. * Take the online courses “Understanding Equine Behavior” and “Training Performance Horses”. Earn certification or work toward a Bachelor of Science degree in Equine Studies. Go to www.horsecoursesonline.com for more information. NextDoes Your Horse Like You?